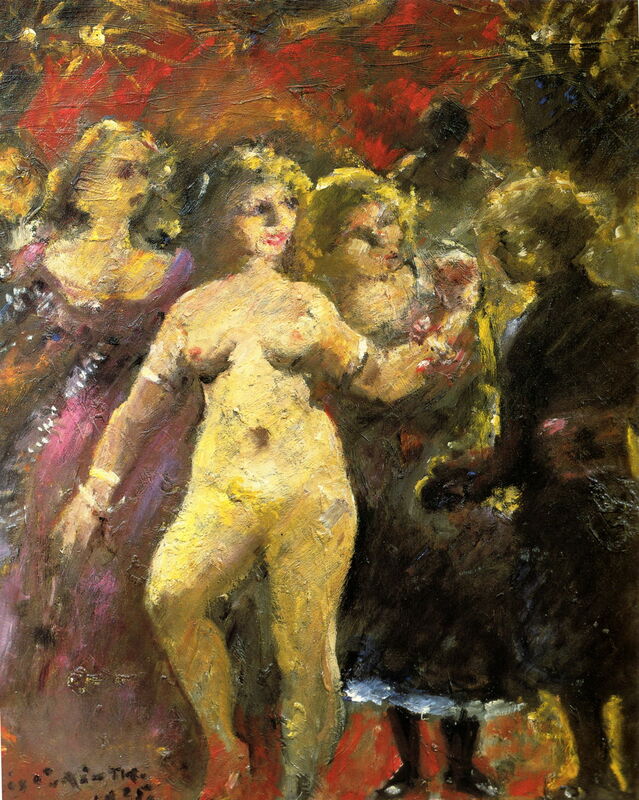 During the 1920s, in the last years of his career, Lovis Corinth’s paintings reached a new peak, both in their quantity and their innovative exploration of colour and texture. Lovis Corinth (1858–1925), Large Self-portrait in Front of Walchensee (1924), oil on canvas, 135.7 × 107 cm, Neue Pinakothek, Munich. Wikimedia Commons. 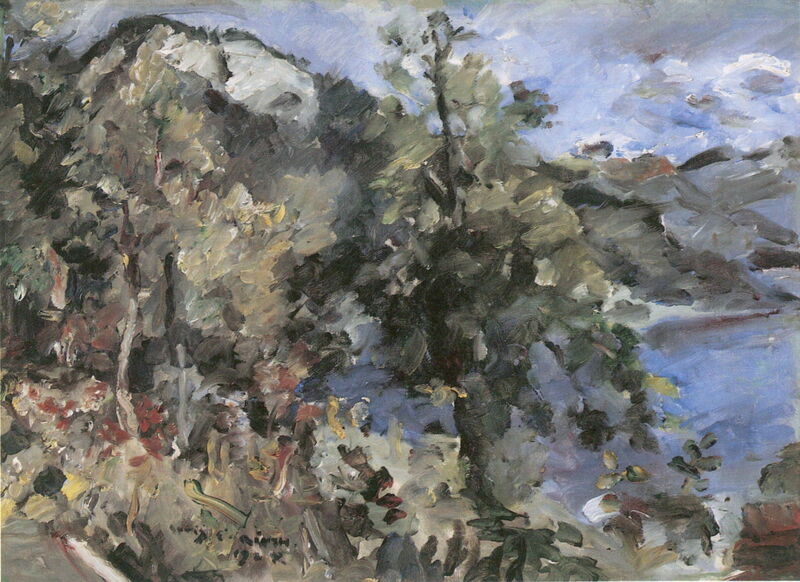 Although Corinth was clearly relishing this intensity, his Large Self-portrait in Front of Walchensee (1924) illustrates his race against the effects of age. 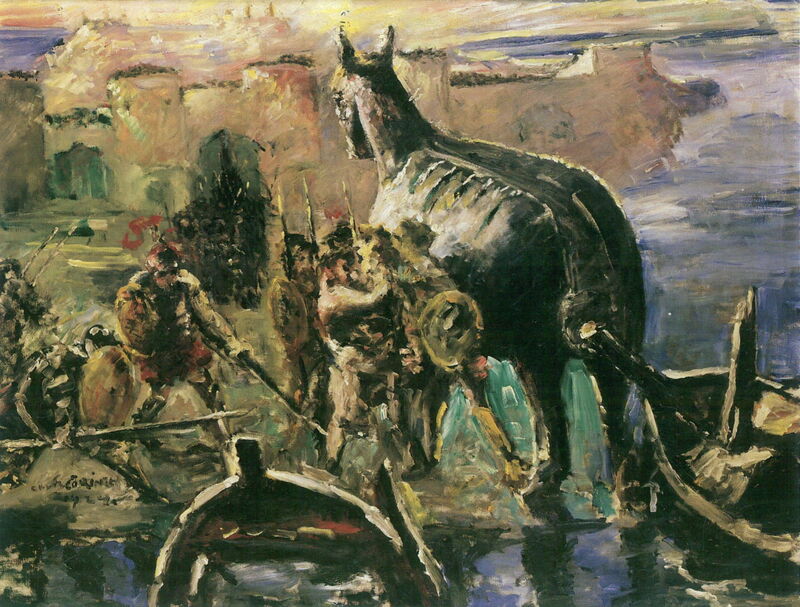 The Trojan Horse (1924) is Corinth’s last major painting from classical myth, showing the wooden horse made by the Greeks in order to gain access to the city of Troy, so they could destroy it. The city is seen in the background, with its lofty towers and impregnable walls. The select group of Greek soldiers who undertook this commando raid are already concealed inside the horse, and those around the horse are probably Trojans, sent out from the city to check it out. Although there are suggestions as to an allegorical relationship between this painting and the First World War, Troy had been a hot topic in Berlin since the excavations at Hisarlık in Turkey in the late nineteenth century by Heinrich Schliemann and Wilhelm Dörpfeld. 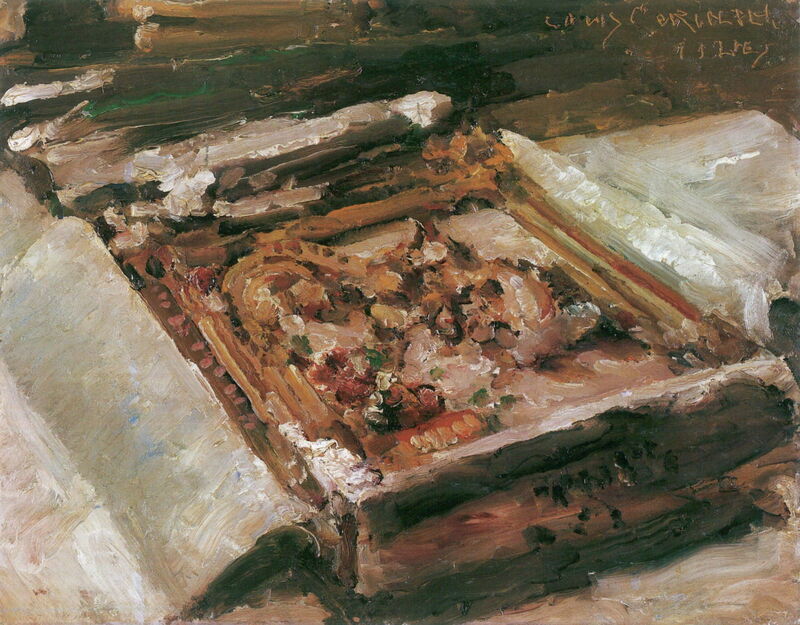 Lovis Corinth (1858–1925), Königsberger Marzipantorte (Royal Marzipan Cake) (1924), oil on panel, 55.5 × 71 cm, Westfälisches Landesmuseum für Kunst und Kulturgeschichte, Münster, Germany. Wikimedia Commons. Corinth also painted for fun: this superb depiction of a Königsberger Marzipantorte (Royal Marzipan Cake) (1924) must have been completed at great speed before the family consumed his model. 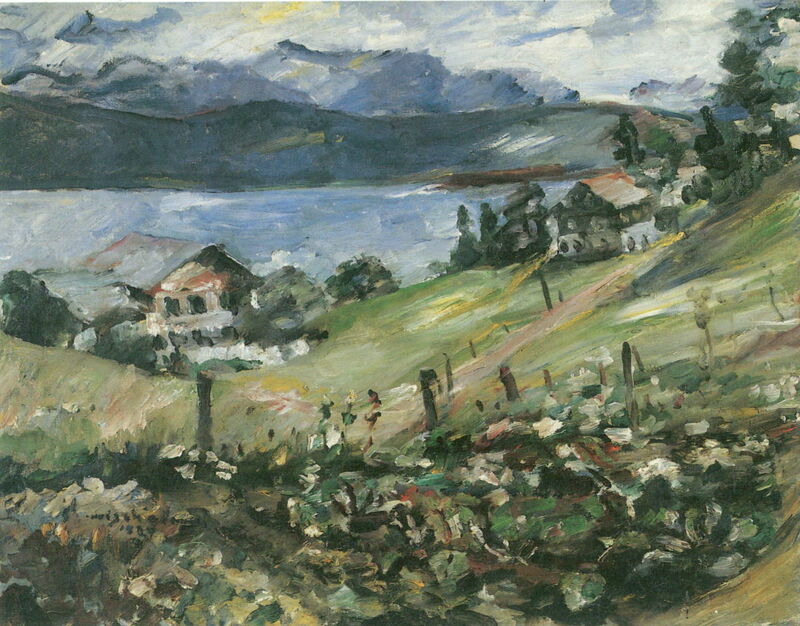 Lovis Corinth (1858–1925), The Jochberg at Walchensee (1924), oil on canvas, 65 × 78 cm, Ostdeutsche Galerie Regensburg, Regensburg, Germany. Wikimedia Commons. The Jochberg at Walchensee (1924) shows this 1567 metre high mountain, which divides the Walchensee from the Kochelsee. Walchensee, Vegetable Garden (1924) was painted away from his normal vantage point, to include the colours and textures of this vegetable patch. 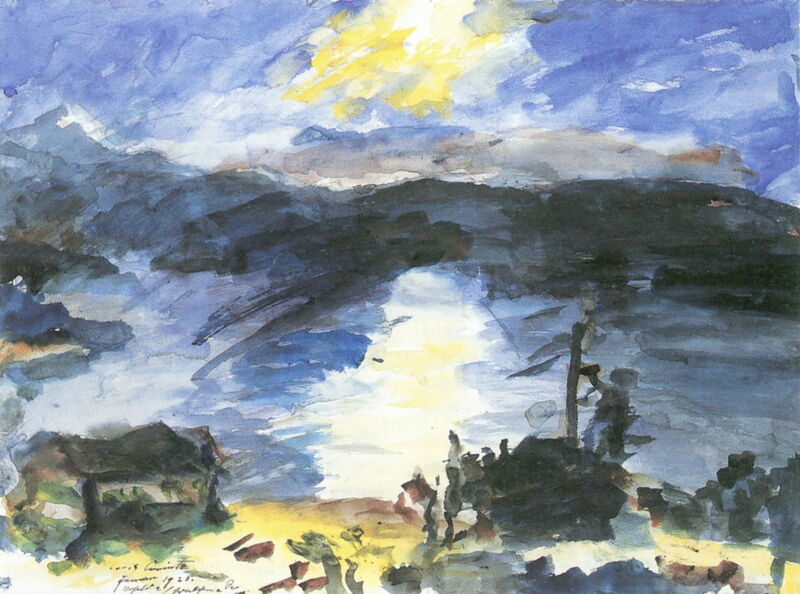 Lovis Corinth (1858–1925), Walchensee (1924), watercolour on vellum, 50.4 × 67.7 cm, Staatliche Museen zu Berlin, Berlin. Wikimedia Commons. Walchensee (1924) is a watercolour sketch reportedly painted on vellum. 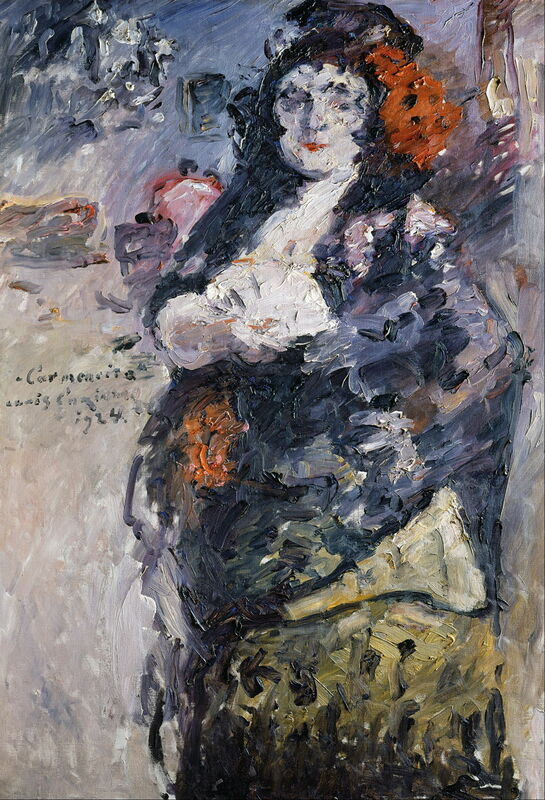 Lovis Corinth (1858–1925), Carmencita, Portrait of Charlotte Berend-Corinth in Spanish Dress (1924), oil, 130 x 90 cm, Städelsches Kunstinstitut und Städtische Galerie, Frankfurt, Germany. Wikimedia Commons. Carmencita, Portrait of Charlotte Berend-Corinth in Spanish Dress (1924) does not, I think, refer directly to the famous Spanish dancer Carmen Dauset Moreno, who had been painted by both John Singer Sargent and William Merritt Chase back in 1890, as she had died in 1910. I suspect that her name had remained associated with Spanish dancers, though. Charlotte Corinth, or Berend-Corinth, had continued painting in the early twentieth century, and joined the Berlin Secession in 1912. She also painted actively when at their chalet. In 1933, she emigrated to the USA, where she produced the first catalogue raisonné of her husband’s paintings. She died in 1967, so I am sadly unable to show any of her paintings. 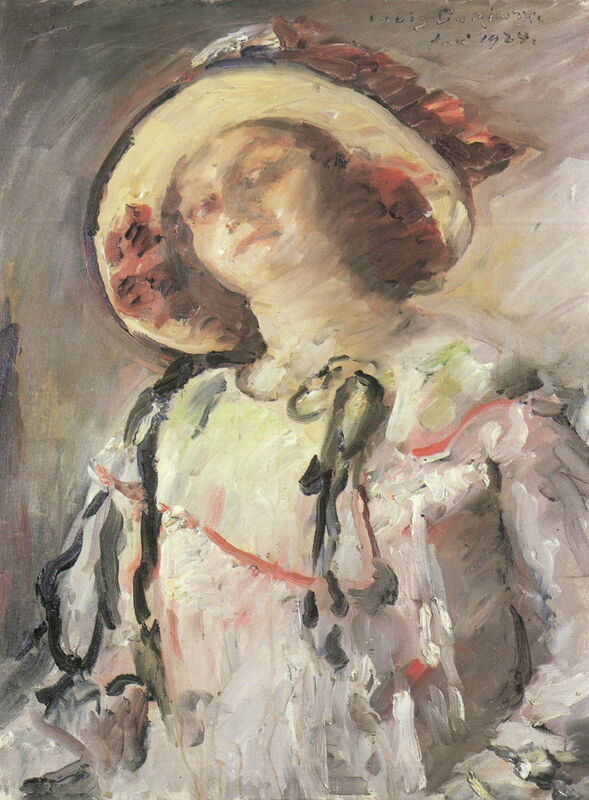 Lovis Corinth (1858–1925), Wilhelmine in a Yellow Hat (1924), oil on canvas, 85 × 65 cm, Museum für Kunst und Kulturgeschichte, Lübeck, Germany. Wikimedia Commons. Probably suspecting that he was reaching the end of his artistic career, Corinth painted members of his family more often at this time. In Wilhelmine in a Yellow Hat (1924) the shy daughter is starting to show some of her mother’s vivacity. Lovis Corinth (1858–1925), Thomas in Armour (1925), oil on canvas, 100 × 75 cm, Museum Folkwang, Essen, Germany. Wikimedia Commons. 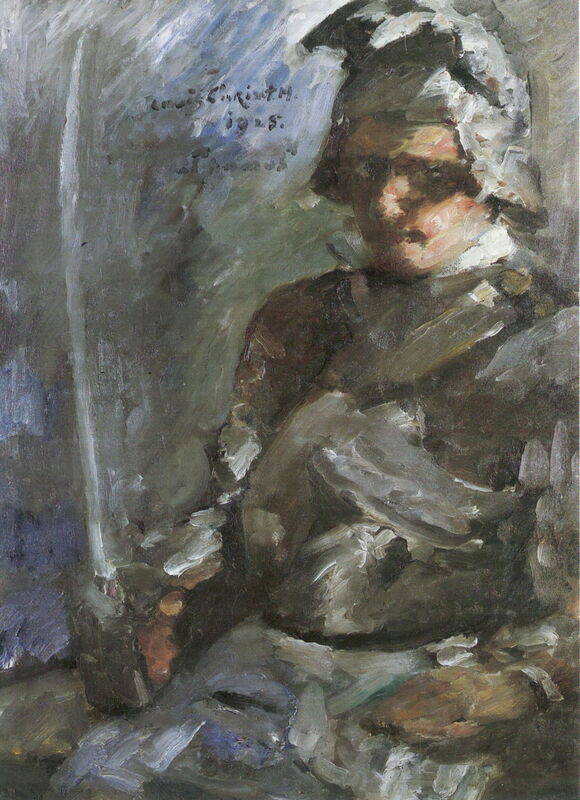 Thomas in Armour (1925) shows Corinth’s older child, who was then 21, wearing the suit of armour which had appeared in several of Corinth’s paintings over the years, a visual record of the launch of his son into adult life. Corinth painted Ecce Homo at Easter, 1925, as an act of meditation to mark the festival. It shows the moment that Pilate presents Christ to the hostile crowd, just before the crucifixion. Christ has been scourged, bound, and crowned with thorns, and Pilate’s words are quoted from the Vulgate translation, meaning behold, the man. 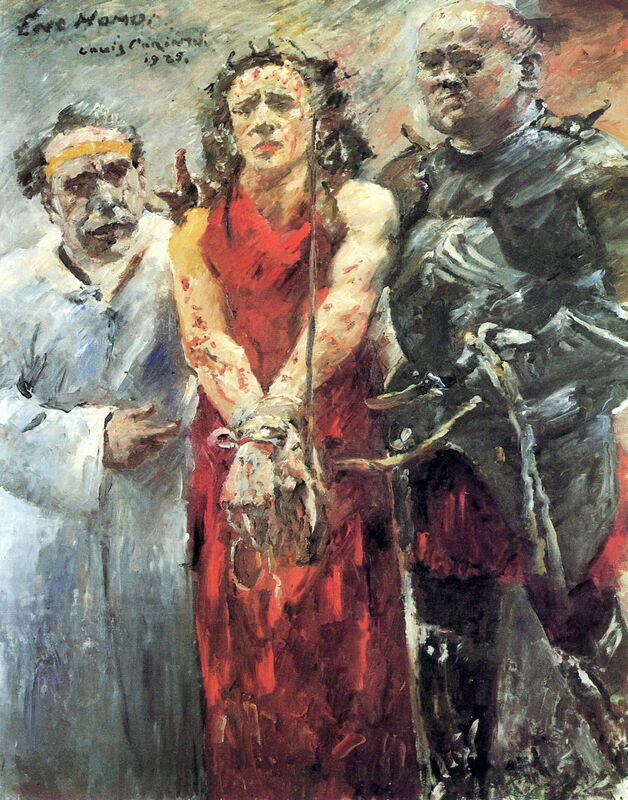 In keeping with his earlier contemporary interpretations of the scenes of the Passion, Pilate (left) is shown as an older man in a white coat, and the soldier (right) wears a suit of armour. Corinth completed this in four days. This painting was bought for the Nationalgalerie in Berlin in 1929, but in 1937 was condemned by the Nazi party as being ‘degenerate art’. Thankfully it escaped destruction when it was bought by the art museum in Basel in 1939. Lovis Corinth (1858–1925), The Beautiful Woman Imperia (1925), oil on canvas, 75 x 48 cm, Private collection. Wikimedia Commons. The Beautiful Woman Imperia was one of the last paintings that Corinth completed in the late spring of 1925, and the last of his fleshly works. It is based on Balzac’s Cent Contes Drolatiques (1832-37), an anthology of tales. This shows the courtesan Imperia, naked in front of a priest, in surroundings which suggest the contemporary decadent cabarets, or a much older ‘perfumed room’. 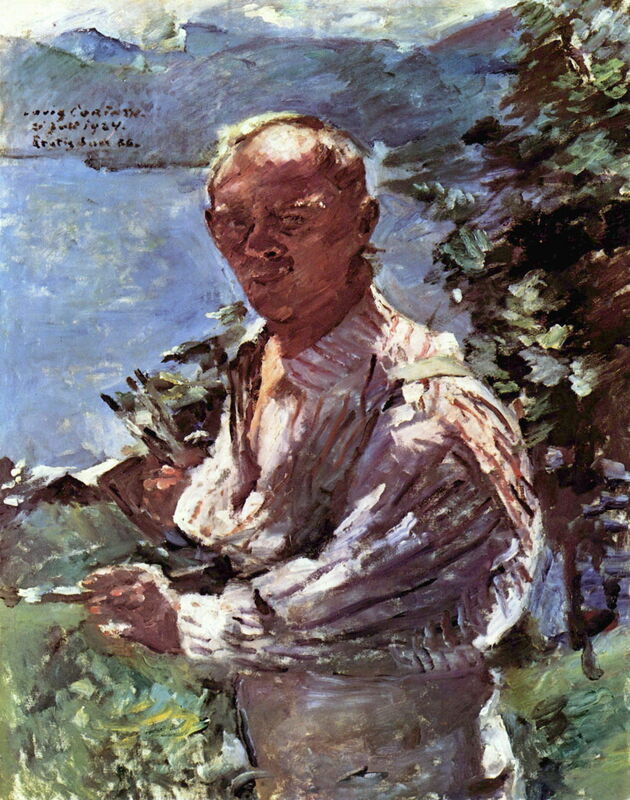 Lovis Corinth (1858–1925), Last Self-Portrait (1925), oil on canvas, 80.5 × 60.5 cm, Kunsthaus Zürich, Zürich. Wikimedia Commons. 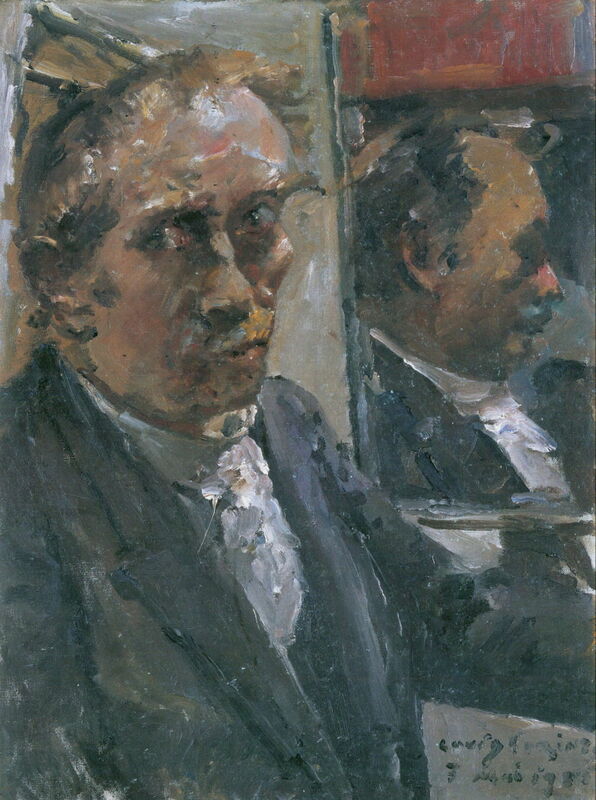 Corinth’s Last Self-Portrait, painted just two months before his death in 1925, is unusual in showing him with his reflection in a mirror. He is now balding rapidly, his cheeks sunken, and his eyes are bloodshot and tired. In the summer he travelled to the Netherlands to view Old Masters, including Rembrandt and Frans Hals, there. He developed pneumonia, and died at Zandvoort on 17 July, four days before his sixty-eighth birthday. He had painted more than a thousand works in oil, and hundreds of watercolours. He also made more than a thousand prints, an area of his work which I have not even touched on. Ironically, it was the rise of the Nazi party from 1933 which prevented him from achieving the international recognition which his work deserved.